Blockchain mining cannot catch a break when it comes to environmental sustainability. This is especially true for Bitcoin mining which seemingly has an insatiable appetite for electricity. A recent paper suggests that by 2020 Bitcoin mining will consume as much energy as Australia. While these estimates are not exempt from criticism, mining does not appear to be best friends with sustainable development, at least not for now. An alternative way to look at this issue is to compare Bitcoin’s mining power use to that of cloud-based providers who have now become well-established tech corporations. 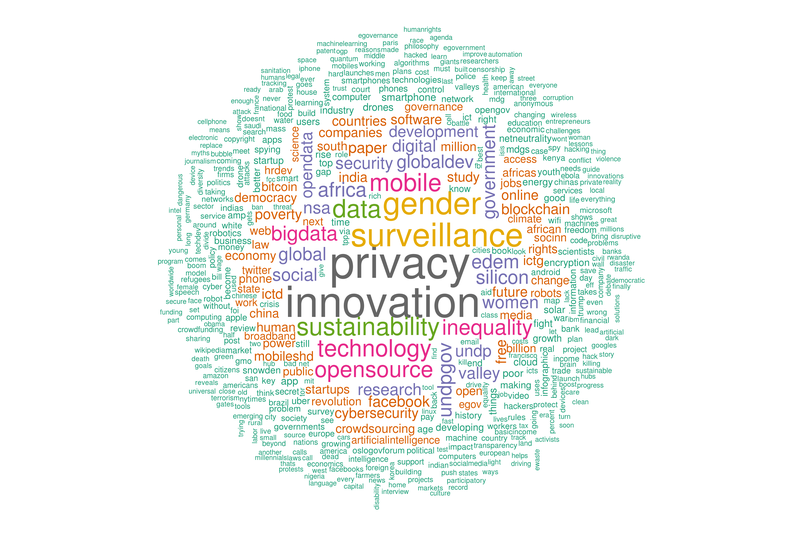 Such comparison should be made not only in absolute terms (gigawatts) but also in relative fashion by considering, for example, the total population being served by these platforms and networks. In a previous post completed over thirteen months ago, I highlighted the intense competition within the blockchain mining sector and its potential for centralization and concentration in both Bitcoin and Ethereum. How much has the situation changed since? 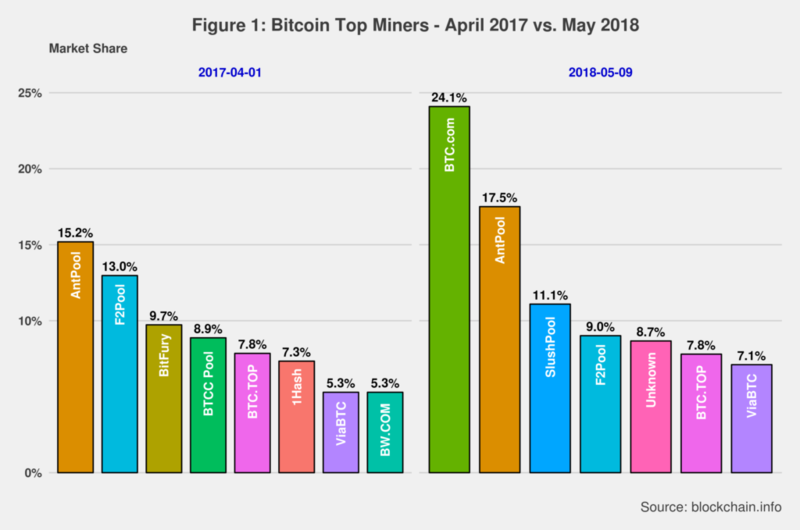 Figures 1 compares the current Bitcoin mining distribution with that of April last year. Competition continues to be intensive. First, the top mining pool has changed since. Second, new players have emerged while others have lost ground noticeably (for example, BitFury and 1Hash). And third, the number of pools and miners with more than 5% of market share has decreased. The latter pinpoints a higher degree of centralization in Bitcoin mining. 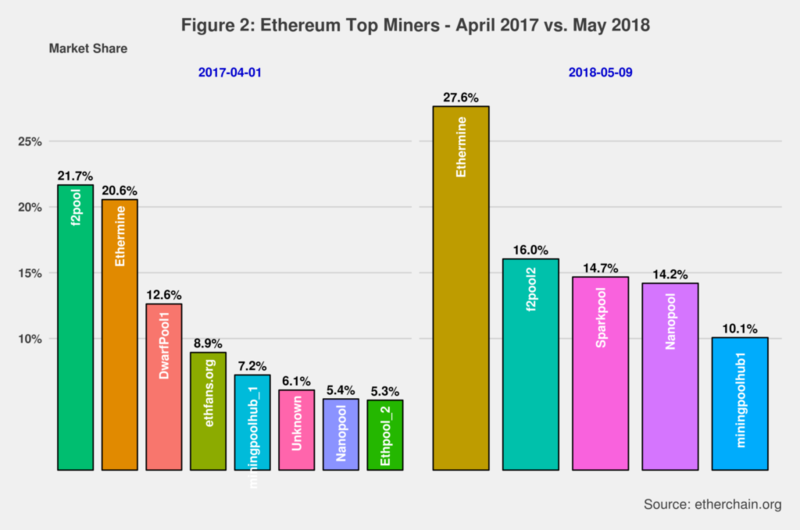 The top mining pool now has almost 25% of the market which represents a gain of nearly 60% in comparison to April last year. The top four miners now control close to 63% of the market, also a noticeable increase relative to a year ago. And the top two Bitcoin miners along with the one ranked 4th, f2pool, are in fact owned by the same company, Bitmain. Bitmain also sells ASIC mining chips and directly competes with BitFury in that space. Recent estimates suggest that Bitmain profits hover between 3 to 4 billion USD per year, including (but not limited to) mining profits. The three mining pools owned by Bitmain have a market share larger than 51%, the threshold required to undertake a majority hash rate attack. For the most part, Ethereum has been spared from the environmental critique that has permeated Bitcoin mining. Ethereum uses a different algorithm to run PoW mining which is immune to ASIC chips and demand less power consumption. This does not entail that Ethereum is exempt from the same trends Bitcoin mining presents. Figure 2 shows comparative data for Ethereum for the same period. Indeed, the evolution of Ethereum mining is pretty similar to that of Bitcoin. Ethermine is now the leading mining pool with a commanding market share of almost 28%. The number of miners with more than 5% market share has diminished from eight to five. And the top four mining pools control over 61% of the market which in fact is a slight decrease from April 2017. While competition has increased and centralization has remained more or less stable, Ethereum mining seems to be undergoing a process of concentration where a few players get most of the rewards, and the majority are left to pick up the breadcrumbs. 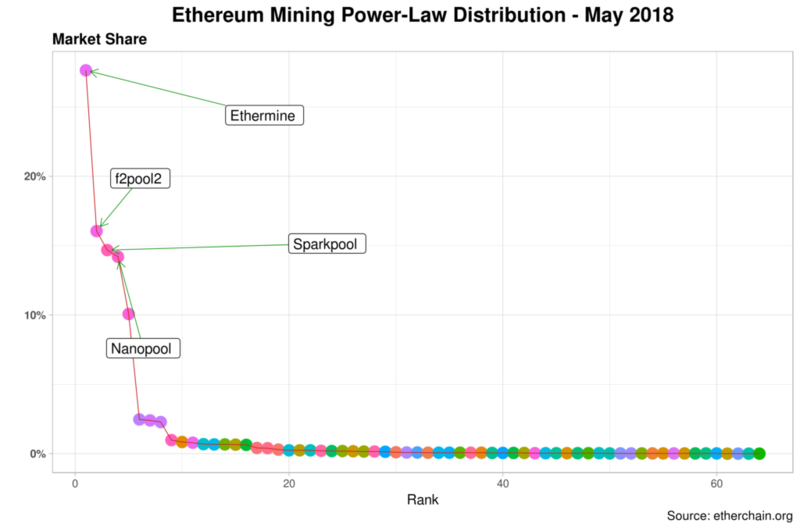 Figure 3 depicts this process and confirms the power-law distribution of Ethereum mining. 92% (59) of the miners have a market share of less than 2.5% each while the top 7% (5) grab over 81% of the total. Not that Bitcoin is that different in this regard. But the data available only reports includes between 16 and 25 mining pools which is probably not the actual total. On the other hand, Ethereum data mining includes close to 90% of all miners. The above numbers should thus be studied in that context. 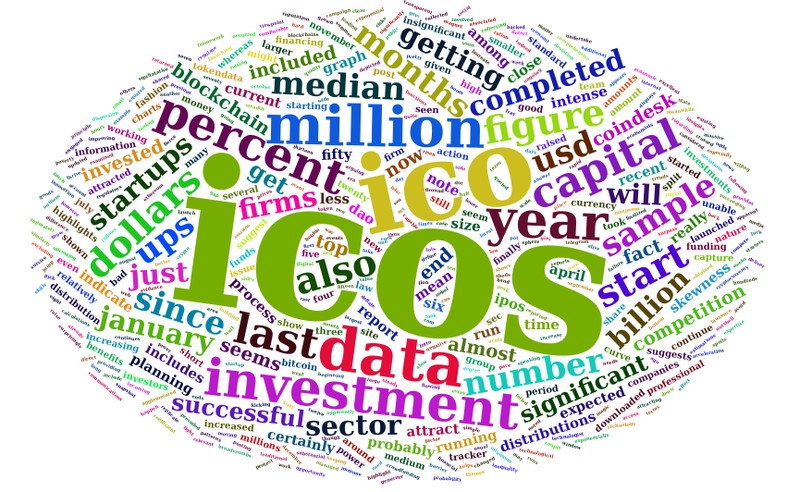 Summing up, we see a trend towards increased centralization and concentration in blockchain mining (limited here to the two main cryptocurrencies) complemented by a competitive process that is still intense. No surprises here as it is still early days in the development of blockchain technology. While alternatives have already emerged, PoW based mining is here to stay for the time being. In the case of Bitcoin, this just means more energy consumption in the short and medium terms. Ethereum’s Proof of Stake (PoS) might prove to be a big game changer if and once it is released. But mining is also a highly profitable business that continues to attract investors. I will explore this angle in a future post. ← Democracy and Capitalism: Friends or Foes?